From driving on city streets or off-road, the new 2018 RAV4 at Toyota of Tampa Bay conforms to any driving situation. Offering a more rugged design than its main competitors – the Nissan Rogue, Ford Escape, Kia Sportage and Honda CR-V – the new RAV4 shines, even when it’s caked in mud. The 2018 RAV4 comes in 10 outstanding trim levels – LE, LE Hybrid, XLE, XLE Hybrid, Adventure, SE, SE Hybrid, Limited, Limited Hybrid and Platinum. To experience the new RAV4 in person, visit Toyota of Tampa Bay – your Toyota dealer near Brandon and Wesley Chapel, FL. Weekends just got a whole lot more fun thanks to the new RAV4 Adventure, which makes its debut in the 2018 model year. It features larger fender flares, durable rocker panel guards, 18- inch black alloy wheels and all-weather floor mats. Equipped with the Tow Prep package, the 2018 RAV4 Adventure tows up to 3,500 pounds. Meanwhile, you can keep all your equipment powered up with its 120-volt, 100-watt power outlet in its rear cargo area. The new Toyota RAV4 delivers the power you need pass slowpokes on the highways and the fuel economy to put gas stations in your rearview. Its 176-horsepower 2.5L 4-cylinder engine delivers all the power you need on the Bay Area’s highways. All-wheel drive is optional on all standard models, and comes standard on all hybrid models. The new RAV4 keeps you entertained and informed, but most importantly, it keeps you safe. Every 2018 Toyota RAV4 is equipped with a standard backup camera and Toyota Safety Sense™– a suite of innovative features, including Dynamic Radar Cruise Control, Pre-Collision System with Pedestrian Detection and Lane Departure with Steering Assist. Meanwhile, the new RAV4 helps you keep your eyes off your phone and on the road with its standard 6.1-inch infotainment touchscreen display with Bluetooth®. It allows you to make hands-free calls, stream music and more! 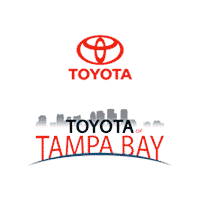 For Toyota financing near Wesley Chapel and Toyota financing near Brandon, visit Toyota of Tampa Bay today. We proudly serve drivers in Tampa, Brandon and Wesley Chapel, FL. Visit us to test-drive the new 2018 RAV4 at Toyota of Tampa Bay today.